The origin of Hofbrau Hefe Weizen dates back to 1589 and since then the "Weisse" has a distinctive place in the history of Hofbrau Munchen. The beer is characterized by its sparkling, by its rich foam and naturally by its unforgettable refreshing taste. Poured a hazy yellow/orange color with big rocky head,smelled clovey and of some ctruis to it.Taste was pretty fresh but I would liked some more spiciness to it,just lacked a little something.I was expecting a little more outta this but wasnt bad by any means. This is a wonderful, traditional German hefe weizen- one that doesn't get a ton of exposure but deserves it. Ranks right up there with the others. Apparently, this was the only hefe weizen brewed in Munich for over 200 years. Talk about a captured audience! Great banana nose, great mouthfeel, perfectly balanced sweetness. Great for a hot summer day. Can't wait to have it on tap. Once again I am still new to the rating process. Great German beer with a nice easy flavor. If you are looking for a easy going good summer beer, this is for you. It has a great taste, but not packed with tons of different flavors. Just a good old fashioned beer. 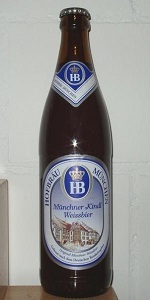 Hofbrau Munchner Kindl Hefe Weizen: In a classic half liter brown bottle. Fantastic looking beer, with a thick white head, with great Belgian lace, and a deep amber glow. Not as cloudy as some other Weiss I&#8217;ve had lately. Nice aroma of yeast and bananas. Nice sweet taste, with hints of cloves, bananas and apples. More carbonation than others of the style. Nicely balanced with a sweet malt aftertase. Very nice and refreshing. Presentation: It was poured from a green 11.2oz bottle into a Weizen glass. The bottle has no freshness date or any info other than the style. Appearance: There is a thick hazy yeast cloud inside of a yellow orange body with light yellow highlights at the edges. Some yeast sediment settles to the bottom of the glass as well. The head on top builds up tall and full on the pour before quickly settling down to a thin cap of foam. It is a soft plain white in color and it hangs on well making lots of spotty slick lacing on the sides of the glass. Smell: The aroma has a light fruity yeast character with a light touch of spice and hops. Taste/Palate: The flavor has a solid wheaty and yeasty, medium to full bodied taste with delicate fruit and bubble gum notes. It finishes with dry dusty yeast and spicy mellow hops. The texture is smooth and almost creamy, but not slick with lots of soft carbonation. Notes: I was very impressed with the outstanding balance, mouth feel and dryer less fruity (sweet/slick) yeast flavor on this Hefeweizen. Medium cloudy yellow color. Foamy rich white head. Nicel lacing down the glass. Lots of clove and sweet sugar yeasty weissbier smells. Loads of bananas and herbs. Pretty spot on flavors, freshness is evident, nice yeasty richness, and crisp herbal finish. Very good weissbeir. Crisp, light to medium bodied, plenty of tangy sweetness. I would really like to pair this with some potato pancakes or something else thick and heavy. A good example of the style. a. Served on tap into a 22 oz. glass. Head dissipated to nothing, no lace. Cloudy yellow in appearance. S. Wheat and a bit of malt. T. A good malt body supported with a bit of fruity yeast. The wheat is present as well. Slight metallic twang. Noble hops in the distance. M. On the lighter side of medium bodied and sightly syrupy. D. A fairly drinkable hefe. Not the best I've had, but true to the style and solid. A little more banana/clove appeal and I'd be hooked. Metallic twang is gone, much more enjoyable. Appearance: Quite cloudy medium golden color with lots of sediment (a portion of the beer was swirled in the bottle prior to pouring). The off-white head was of moderate size with lots of broken lace. Aroma: Very pronounced clove notes, ripe bananas, other fruits, and a distinct pepper note. Taste: Begins with wheat malt, and a touch of soft carbonation, soon followed by yeast, lemon, cloves, and ripe banana notes. Finishes dry with a spicy ginger and pepper note. Mouth feel: Nothing spectacular, but reasonably smooth. Cloudy light golden beer with sediment, great head. Lovely spicy and fruity aroma that makes you expect more than the flavour can fulfill. Dry and mildly spicy, short aftertaste. Not bad, but I've had better Weissbiers. A solid hefe in every way. Hofbrau has yet to dissipoint me. Pours a cloudy straw color . . . Pretty typical for the style. Aromas are the usual bananas and cloves. Some spice and a slight skunkyness as well. Same goes for the taste. Feel isn't quite world class due to it not being as creamy and crisp as I had hoped for. Overall a terrific hefe from Germany !